Apple's WWDC logos through the ages: what did they tell us? Apple's WWDC 2014 developer conference is set for June 2 and we're already feverish with anticipation. What will Apple announce? iOS 8? An OS X Mavericks successor? An iPhone, an iPad, some Macbooks? For the sake of our wallets, we hope not all of the above. As in previous years, the company has designed a natty new logo for the occasion. But what can we tell from these colourful squares and their optical shenanigans? We've taken a look back at previous years invites with the benefit of glorious hindsight to see what's what. The original iPhone was announced at MacWorld in January 2007 and speculation about an iPhone 3G was rife ahead of WWDC 2008. The invite, showing a landmark (the Golden Gate Bridge, obviously) split into two hinted at two major announcements - and so there were: Hello iPhone 3G, hello App Store full of third-party apps. Also unveiled were iOS 2.0 (! ), push notifications and MobileMe (RIP). An uninspiring look for WWDC 2009, with the iPhone and its apps taking a rather drab centre stage. All we could really tell about the show from the teaser logos was that the iPhone was going to be the focus. 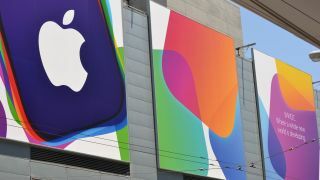 We were hoping for iOS 4.0, a new iPhone and a major Snow Leopard update to "give Windows 7 a run for its money" before Steve Jobs took to the WWDC stage to reveal the iPhone 3GS, an underwhelming Snow Leopard update and a new MacBook Pro line-up. Our phone expert Gareth Beavis was also unimpressed by the iPhone 3GS, saying that it "failed to lay the smackdown on the Palm Pre." Oh Gareth. Apps were firmly on the menu for WWDC 2010, but the logo didn't exactly hint at the iPhone 4 that Steve Jobs ended up announcing at the conference. Described as the world's thinnest smartphone, it launched with a now-laughable 9.3mm depth, a mobile gaming game-changing gyroscope and a host of antenna-related problems. Now here's an image that hints at the conjoining of Mac OS and iOS - all those apps sitting in the MacBook-esque sea of grey? It was the logical conclusion. Unfortunately, it was also the incorrect conclusion. The iPad had launched in the previous year and we expected iOS 5 to be announced at WWC 2011 hand-in-hand with the iPhone 5. What we got was iOS 5, iMessage, Newsstand, over-the-air updates, OS X Lion and the phrase "Post PC". In a shock move for Apple, the iPhone 4S wasn't unveiled until October 2011. Here's where things started getting colourful. The app-ish squares that make up the Apple logo hinted at news of iOS 6 in that they looked like app logos and we were expecting iOS 6. The show sold out in record time (under two hours) and did indeed see the launch of the new OS. The logo didn't exactly tip us off to the debut of the ill-fated Apple Maps app, though. Well hello, new slimline font for iOS 7. We could only identify that with the benefit of hindsight, but Apple hadn't been this obvious since the "landmark" invite of 2008. Rumours that a whole new look for iOS was on the cards percolated for weeks ahead of WWDC 2013 and we weren't disappointed by the flatter, cleaner iOS 7. Mac OS X also got a rejig in the form of Mavericks, and Apple also launched iTunes Radio. What did we divine about WWDC 2014 from last year's logo? Well, not a whole lot more than the obvious. iOS 8 was expected, and OS X 10.10 certainly wasn't a surprise. The iPhone 5C-ish colours and iOS 7 font suggested the new mobile OS wouldn't be a big departure in terms of design - and it wasn't. Apple did take a more radical step forward with the introduction of HomeKit, although there wasn't anything to hint that it was coming. Which brings us to 2015. A lot has changed since last June; we now have an Apple Watch, a bigger iPhone, and new services like Apple Pay. If anything, the new logo evokes a post-Jobs Apple that's now firmly in the hands of Tim Cook. Or at least the text does. The image is just one massive Venn diagram of shapes and colours that, given this is Apple, could mean absolutely anything or absolutely nothing. The Watch will undoubtedly be a huge focus of WWDC 2015, as suggested by the circles, but could there be a hint of big changes to come in iOS 9? Further, after Cook's comments about TV being "stuck back in the 70s", now would be a good time for Apple to announce its solution to that problem. That square is very central and TV-like, don't you think? If there are any missed straws in need of clutching, do let us know. We'll be reporting on the big WWDC 2015 keynote live on June 8, so stay tuned for all the official news as it breaks.